Torch is a Free and amazing software that offers Powerful Browsing experience along with Built-in Media Downloading and Sharing Features. 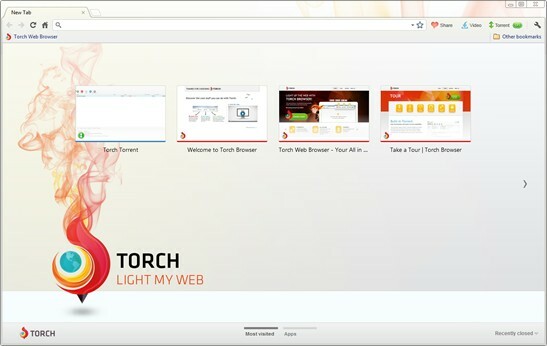 Torch Browser is built with Chromium Technology platform which increases the usual Browsing Speed unlike other Browsers. Torch has a User Friendly Interface which helps in Browsing easily and Users need not install additional Softwares to Download Media like Music,Videos and others, Torch has In-Built Grabber to Download online Media. Torch Browser Looks this way. 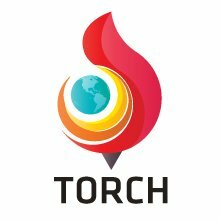 Let Us give a look at the main Features of Torch. Built-In Torrent: Torch has Built-In Torrent Capabilities which helps Us in downloading Torrent files directly form the browser avoiding the need of additional softwares. Media Grabber: Media Grabber is a new embedded Features in Torch which enables to Save Media like Music, Videos from Youtube and any other online Media also Secure and Safe form Malwares and Spywares. Easy Sharing: Sharing has become more easy with Torch. It gives an Built-In option to share any link to Facebook & Twitter. Download Accelerator: Using Torch, we can download files with maximum speed as it is based on Chromium technology, has several amazing add-ons which are Chromium-Based. Secure Browsing: Torch ensures safety from Malwares, Viruses, Phishing links and other malicious websites.